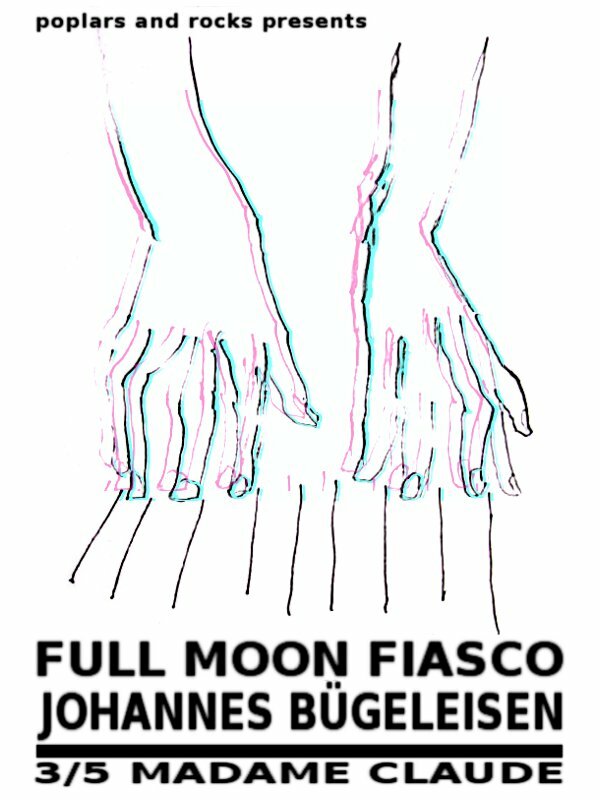 poplars and rocks in spring blossom may presents JOHANNES BÜGELEISEN and FULL MOON FIASCO. in berlin you meet everyone, and even if you don‘t know it, you can be sure you are talking to a musician – and the funnier thing: the nicer people make also the more likeable music. barpeople are musicians anyhow. one of my two, four favourite barman in town was a canadian called Ryan, until I lost sight of him – I met him again last year at a tiny festival in Berlin Mitte and asked him what he did there – it turned out he just had played a show under his new moniker: JOHANNES BÜGELEISEN. Ryan, being artist and musician, merges everything in his über-ego Johannes Bügeleisen: harsh noise, dub, samples, distorted vocals, house, minimal NDW keys, tribal beats. last year I received a box with his self-produced work: four beautifully designed, printed and self-wrapped cds. beside a noise music based concept drama, it contained his two releases from 2011, Tiger Bonus and Mouse Trap, latter with absolute lo-fi radio-compatible music (but no idea what is being played really these days when stopped listening some years ago, but I can only assume it got worse) like Q or Tetanus Scare, the fourth album being his latest so far, Canary Kingdom, released 2012, all on Tar and Feather, opening with Military Hospital, dancy and dark in criticism. humour, brains, and refusal lie close together – and embracing it all at the same time. Johannes Bügeleisen recently works on new material. I recommend to get his albums, you won‘t get bored. even more, don‘t miss his glamorous live performance. more guitar based in distortion and exploration is FULL MOON FIASCO, a concept one man bedroom band that started out in New Zealand, until it grew a full band, that dissolved after several shows and local fame, for the moment finally by the head having settled in Berlin recently, and quite comfortably so. when I met Will he had just come over with two friends to stay for a bit in Berlin: Thought Creature played then a few, wonderful shows at crazy nights, until the others had to move back for the usual money and visa reasons – Will though came back, started Black Cat, and continues now with Full Moon Fiasco as a solo idea to explore the psychedelic depths of untravelled territory, and as duo in live performance. Full Moon Fiasco’s still last album, Cosmic Palms, was out 2010 on Muzai Records. If you like Jim Morrison and Syd Barrett, you will love Full Moon Fiasco. friday, may 3rd, madame claude, berlin kreuzberg. bands on between 10pm and 12pm. on decks after Rad Spin Rotate Club. admission donation. celebrate the nights where good people come together!